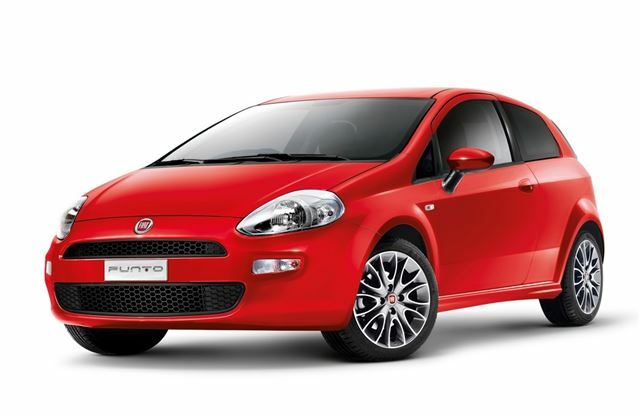 Fiat has announced prices for the revised Punto range which goes on sale this month. Prices start at £9990 on the road for the Punto Pop 1.2-litre 8 valve while the most expensive version is the Lounge 1.3 MultiJet diesel which costs £15,600. There are two new engines in the line-up with the 85bhp version of the MultiJet diesel and the 0.9-litre TwinAir. The full engine line-up is: 1.2 8-valve petrol (69hp), 1.4 8-valve petrol (77hp), 1.4 16-valve MultiAir petrol (105hp and 135hp), TwinAir 0.9-litre petrol (85hp) and 1.3 16-valve MultiJet diesel (75hp and 85hp). All models are fitted with an engine Start&Stop system as standard to help cut emissions. In terms of trim levels, the new Punto follows the 500 and forthcoming Panda with three specifications - Pop, Easy and Lounge. There is also a sports version based on the Easy level grade called GBT. Standard equipment on all models includes remote central locking, electric front windows, driver and passenger airbags, window airbags, a CD stereo, electric power steering and a height-adjustable driver seat. Easy models add a leather steering wheel, 15-inch alloy wheels and air conditioning with the GBT getting sport suspension, a rear spoiler and side skirts. Lounge adds climate control, front fog lamps, cruise control, ambient interior lighting and an electric sunroof. The facelift includes styling tweaks including fully colour codes bumpers plus there are three new paint colours - Brit Pop Blue, Tango Red and Underground Grey. Inside there are new seat fabrics and refreshed dashboard inserts.